Inkerman - Sevastopol suburb, Inkerman stone is mined and is a dense white limestone, used for cladding buildings. Crimeans extracted the stone for a long time, so in the rocks formed from a plurality of the catacombs and caves. Inkerman is an ancient cave city, worn in the Middle Ages the name Calamita. At that time there flourished principality Theodoro and Calamita was one of his castles and a major trading port. Around the VI century BC built Calamita fortress to protect the important trade routes, which were held here and led from the central part of the Crimea in the Chersonese. This century and is considered the foundation of Inkerman. The remains of the fortress on Mount Calamita are Monastery in the territory of the modern city of Inkerman, in the estuary. Black. At the end of the XIV century the Crimean feudal princes build a fortress on the remains of old fortifications in order to counter the Genoese colony Chembalo. Initially, gate tower and defensive walls were built. A little later, the defensive walls were reinforced with five bunk square towers. But defense capabilities erected fortresses were questionable because of the small wall thickness (about 1 meter) and the poor quality of construction of towers. In 1434, the castle was captured and devastated by the Genoese. They fortified it and built an additional tower, but in 1441 was forced to return the castle its previous owners. In 1475 fortress was called Inkerman - due to its capture by the Turks ( "cave fortress" Inkerman translates). During the XVI-XVII centuries the Turks strengthened the defensive walls and complete the round tower, the castle was already a defense capability and adapted for combat guns, which had already appeared in those days. Today the fortress there were only minor remnants of the towers of facilities. The breakage of the rock on which the fortress Calamita is Cave Monastery of St. Clement. 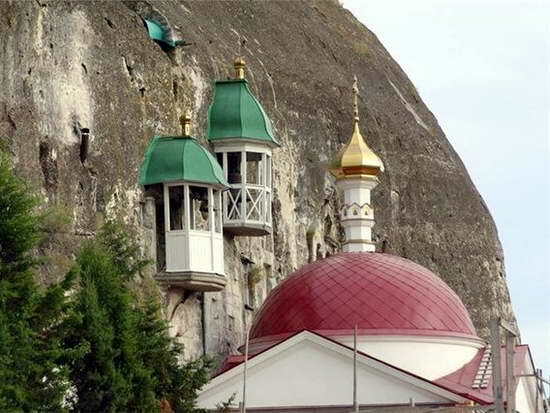 Founded the monastery was still in the VIII century, a place so called cave fortress or Inkerman. Fortress Calamita with the cave monastery of St. Clement is an integral complex and unique attraction of defensive architecture of the Crimea.